If your hectic life makes you yearn to escape to the countryside, why not create a little “get away” in your own home? Believe it or not, the bathroom is a prime candidate for a country theme. This is the room you use to shower or soak away the day’s dirt as well as prepare for the day ahead. Why not give it a relaxing, country feel? The easiest way to give your bathroom a “down-home” country feel is to add rustic accessories. Wooden pegs are a clean, simple way to add a country feel to hanging towels and bathrobes. Pine baskets are a charming way to hold guest towels, and a large wicker basket on the floor keeps bath towels handy as well as adding a country-life touch. If your bathroom is shared by many people, you might want to consider using wire baskets instead of wood or wicker. The large amounts of steam created by numerous people showering can create the perfect environment for mold on wooden or wicker baskets. Either make sure you seal the baskets before using them, or substitute the kind of wire baskets used to gather and store eggs on a small, country farm. Glass mason jars make great storage containers in a country bathroom. They are great for holding all the little miscellaneous things that float around a bathroom. You might have toothbrushes standing head up in a tall jar, and use progressively shorter jars to hold things like combs and hairbrushes, hairpins or barrettes, and cotton balls. You can purchase plain canning jars in most supermarkets, but to give your bathroom even more of a country feel, look for “bail-lid” jars with a glass top on hinges that clamps down tight. These are especially good at keeping cotton balls clean and dry until they are needed. Browse antique and “collectible” stores and you’ll find beautiful antique canning jars that will add an authentic feel to your country bathroom. You may find that these simple touches make you want to go “country” and add vintage style bathroom fixtures. Home improvement stores and bathroom showrooms have an amazing range of faucets, sinks, and tubs to meet your rustic bathroom design needs. A claw foot bathtub and pedestal sink will take your bathroom back to a simpler time. Need storage? A pine armoire fits the country theme perfectly, and is easy to find either finished or unfinished. If you choose to finish the piece yourself, products are available to help you give it an old, crackled or distressed look. Whether you opt for just a few flourishes or completely redo your bathroom, your time will be well-spent. Your new accessories not only improve the functionality of your bathroom, they create a peaceful place to escape the frantic pace of everyday life. 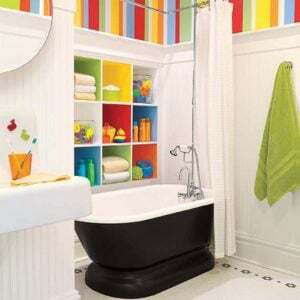 Cheap Bathroom Fix Ups for Any Family! Can you please tell me where you found the sink/vanity/table? Was this made or reclaimed or available for purchase? Sorry Craig, which one are you talking about? In the top picture where is the three shelved cabinet from? Great work! Love these ideas. These are the simple and easy way to change the whole look of the bathroom. I am inspired by your work and got some great ideas. Thanks and keep sharing.